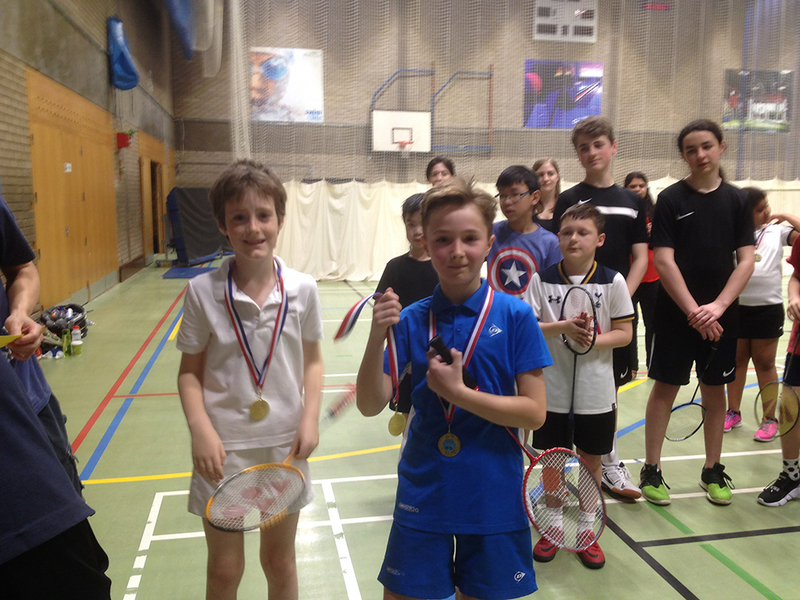 Last month a junior fun tournament was run at One Leisure St Ives. Many junior players from across the county in the age groups U11, U13 and U15 participated in the tournament, which is designed to give players an opportunity to get a taste of competitive play. The hall was filled with young players, and the day was played in great spirits. Many congratulations to everyone involved, and especially to those who came out winners. Details of the winners and photographs of them with their medals are available in the gallery. Many thanks to the Cambridgeshire Schools Badminton Association and especially to Sandra Dennis for her help in setting up and running the tournament. On Saturday 21 April Cambridgeshire Badminton Association and Cambridgeshire Schools Badminton Association held a Junior Fun Tournament at the One Leisure Centre in St Ives. Children in the U11, U13 and U15 categories from around the County competed in a fun competition designed to give less-experienced players a taste of competitive badminton. Photographs of the winners are available on the Gallery pages. Many congratulations to everyone who played in such an excellent atmosphere, and thanks to Sandra and the team from CSBA for running the day. Keep an eye out for more tournament like this around the County over the next year. The Cambridgeshire Badminton Association welcomed the return of the Badminton England Senior Silver Circuit at the weekend, holding the 49th Cambridgeshire Senior Silver Tournament all day on Saturday at the Cambridge Regional College. The Silver Circuit is the second tier of national competition, and attracts top County players from around the Country. This tournament was a welcome return for the County, which has not hosted the event since 2015. Every discipline was hard fought, with excellent games throughout the day. It was in the Mens singles where Cambridgeshire enjoyed the greatest success, with the County's Min Dabasinskas winning the final against England junior Ethan Rose with a nail-biting 23-21 second game. In Womens singles Suffolk's Katie Scott took the honours. In the Mens Doubles James Scott and Daniel Hooper (also of Suffolk) were victors in a three-end final against Daniel Leers and Daniel Brown (Herts and Northants). Katie and James then teamed up to take the Mixed Doubles final. Finally, after playing a round-robin format, Emma Hooper and Natalia Mitchell (Nottingshamshire and Oxfordshire respectively) won the Womens Doubles competition, after winning all of their games. Cambs' other notable result was Neil Place and Daniel Bates, who narrowly missed out 18-21, 20-22 in the semi-final of the Mens Doubles. Complete results of all the events are available on Tournament Software. Many congratulations to everyone who played so well during the day, and to the worthy winners. We hope to be able to run this, and several other circuit tournaments regularly. Photographs of all the winners are available on the Gallery pages. Cambridgeshire's own Olga Chernysheva travelled recently to Cochin in India as part of the team representing England in the BWF World Senior Championships. The BWF World Senior Championships are held every two years and the Championships is a prestigious individual event for players. The winners of each category is awarded a gold medal and crowned World Senior Champion in their particular age category. The runner-up gets a silver medal while the third place winner gets a bronze medal. This year, the championships were held on 11–17 September in Cochin Kerala, India. After a week of competition, playing with her Russian partner Olga Kuznetsova, Olga faced another mixed-country pair of Louise Culyer (England) and Dorte Steenberg (Denmark) in the final of the O40 women's doubles. After a hard match, the two Olga's succumbed 21-12, 21-14, and were awarded an amazing silver medal. Everyone from Cambs Badminton wishes Olga many congratulations on this achievement!! You can see the full results on the BWF website. Junior badminton in Cambridgeshire descended on Burwell again for two weekends in March, where the U20 and U16 Restricted Tournaments were held. Open to all juniors resident in the County, the Restricted Tournaments are the annual events held by each County to allow juniors players to compete for the title of County Champion. Photographs of the winners being presented their trophies are also available on the Gallery page. Congratulations to everyone who participated in an event which was lots of fun, and saw some excellent games. Many thanks to the volunteers who helped the events go smoothly, and especially to Tournament Secretary Neil Place. U15 Victors lift U19 Titles! As with the U15 Restricted held earlier in the year entries by the girls was greater than the boys - an unusual situation! The boys played in one group of 6 as a round robin and it produced some tight games with 21-19 and 21-20 appearing in the results (there was not setting at this stage of the competition). At the end of the Round Robin section points are added together to decide who proceeds to the semi finals.There was a clear winner on 105 points, then two boys on the same number of points (102) who were separated for the semi finals places by which one beat the other in the round robin, the forth place had 84 points. James (the reigning U15 Champion) went on to play a mature game by beating Leo in the final and lift his second Restricted Title of the year. The girls were in two groups one of 4 and the other of 5. In the girls competition Group 2 was straight forward with two clear winners but Group 1 was a real tight battle for the semi final places with 3 of the five ending on 68 points. One of these had won a single games whereas two had won two. Of those two the victor during the round robin phase proceeds to the semi final. In the final, as with the boys, Chanumi (U15 Champion) beat her older opponent to lift the U19 title. With just 3 boys pairs entered a Round Robin was played and the 2 highest total points scores would play a 3 game final. The highest points system resulted in a pair that had lost both their games to 19 going through to the final ahead of a pair that had beaten them in the round robin. Compared to recent years there was a good entry with 5 girls pairs. After a few close games in the round robin there were 2 clear leaders who played for the U19 title. Full scoresheets and photographs of winners and singles runners-up are in the Gallery pages.